This must have taken a long time to do! Awesome. I am surprised I have not seen any sand artists in Boulder. Looks like a star, but then each corner appears to have a lobster claw on the end-very unique!!!! How did you do that? Looks so cool! The other “points” look like rosebuds. I love your pictures. I always wonder if you just stumble on to these things, or if you’re more observative than me. Agree on your assessment of (1) the photography of these rare artistic gems and (2) the sand artistry itself. Can you imagine the dedication one must have to put everything you love into a piece of art, then realize that it has only a moment of appreciation before it disappears forever? I compare this act as a reflection of Nature in the sacrifice of a beautiful flower to procreate the species and/or food provision for another species’ survival. Awesome! This is called ‘Rangoli’ in India and been done for thousands of years. Very intricate designs for having fun and bringing good feelings. This photo is beautiful! This is incredible talent – thanks for sharing! Reblogged this on Jamii Kenya. wow! its amazing! Wish I could see that for real! This is just sand? Wow! I enjoy drawing every now and then, but this takes the cake, yo! I’m jealous of that skill. Reblogged this on Stormie's Mind. Love the neon-glowing edges, like crab claws! This really “grabbed” me! Such a wonderful talent! Thanks for sharing and adding some color into this gray autumnal day. This is sooooo cool. How did he do that? 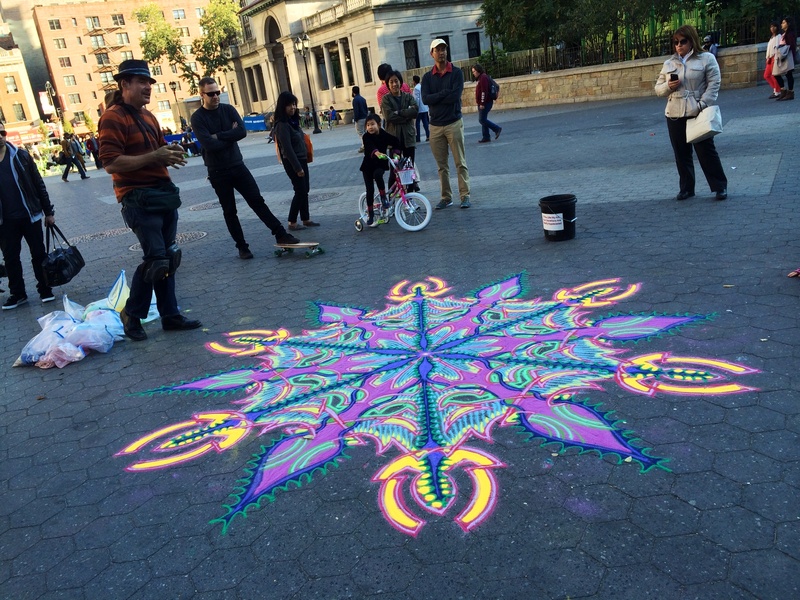 It reminds me of the chalk drawing in “Tangled.” I love that movie! I wonder how long he procrastinated before he actually did the project. It would take me weeks to get around to something that complicated! How long does this stuff last? Pretty. Love the vibrant colors! Beautiful. Love the vibrant colors. Yes. That is what caught my eyes too! Very nice..I myself make this during the festive season at my house. we call it “Rangoli” ( a design with colors) here in India. Very nice indeed..I myself make this during the festive season at my house. we call it “Rangoli” ( a design with colors) here in India. amazing….. artist on the road, i’am like that…. This is gorgeous. I love how bright the sand is compared to how chalk would have shown up. Nice work Joe. Thanks for sharing! i love art works down there. beautiful! Love the colors. And love that art is everywhere!! Reblogged this on Listen to me. so sweet. get me to a bigger city. Reblogged this on Outside The Box. Would take a lot of patience to do this. Very intricate! Reblogged this on As Above, So Below. Oh so beautiful! Thank goodness there’s a great photographer around to capture the image of fleeting environmental art! Reblogged this on Muhammad Gilang Gumilar. How does it not get damaged, or is there some device the artist uses to prevent the art he created from deteriorating? A star with crab- or lobster-like pincers! It looks really great !!!!!!!!!! Reblogged this on Little black lies..
Republicou isso em colagem liberdade. I remember meeting Joe 16 or 17 years ago and it’s been great seeing him stick to it and thrive. That sand is lucky.